There are a handful of places that I like to refer to as “my happy place” and I’m not even kidding when I say that Floor & Decor is top of the list! 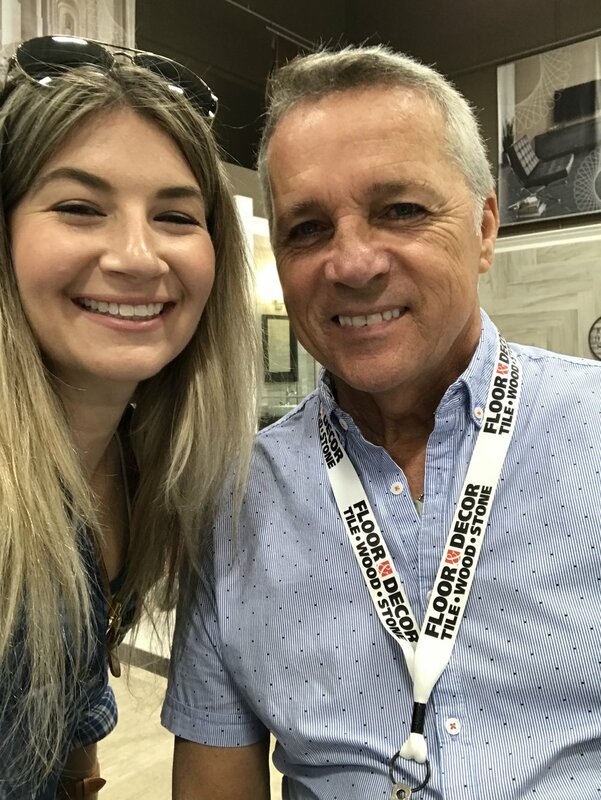 I’ve been a fan/shopper/unofficial promoter for years and love referring my clients to their wide selection of tile and flooring. They have top-quality products at rock-bottom prices and always in-stock. I’ve even joked that while many decompress from a stressful day at the gym, mall, or even grocery store, I prefer to mindlessly peruse the aisles at Floor & Decor. Ask my husband. You can imagine how excited I was when Floor & Decor recently invited me to partner with them on a home improvement project. In my own home. I mean. Can you believe it?! I immediately started brainstorming the ideal project for this type of partnership. Jumping between the boys bathroom, the guest bathroom, and our master bathroom. The possibilities had my creative juices flowing and I nearly combusted from all the ideas floating around my head. In the end, between timing and the ole’ wallet/budget variable, I decided to focus my attention on a manageable master bathroom vanity wall update. pre-closing on the house, before the builder grade sconces and mirrors were installed. Fortunately, Floor & Decor arranged for a private tour of my local store. Which was amazing, because, although I had been to this store many times before, it was a unique behind the scenes experience, learning about their products and what works best in certain rooms over others. The store itself is gigantic, think mega warehouse and very well organized. When you entire, you are immediately greeted by a staff member asking if they can help you. Typically, I’d say “no thank you” and meander around. This time, though, I met up with Michael, the General Manager of the Design Center. He was there to give me the grand tour, show me around ALL the departments, and answer any question I threw his way. Michael was so lovely and informative, as are all of the Floor & Decor staff members. We first walked around the Design Center gallery at the front of the store. It had a variety of vignettes set up, with products actually installed for your viewing pleasure. This was a great inspiration area to get ideas and see firsthand how certain materials look paired together. This beautiful mosaic marble tile backsplash was screaming for a mirror selfie! 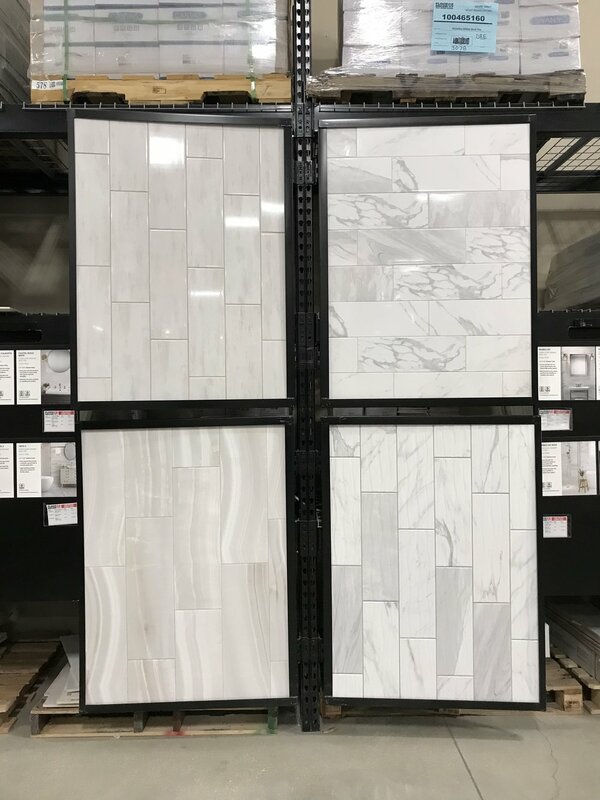 As we made our way to the tile section I was in awe of the selection. 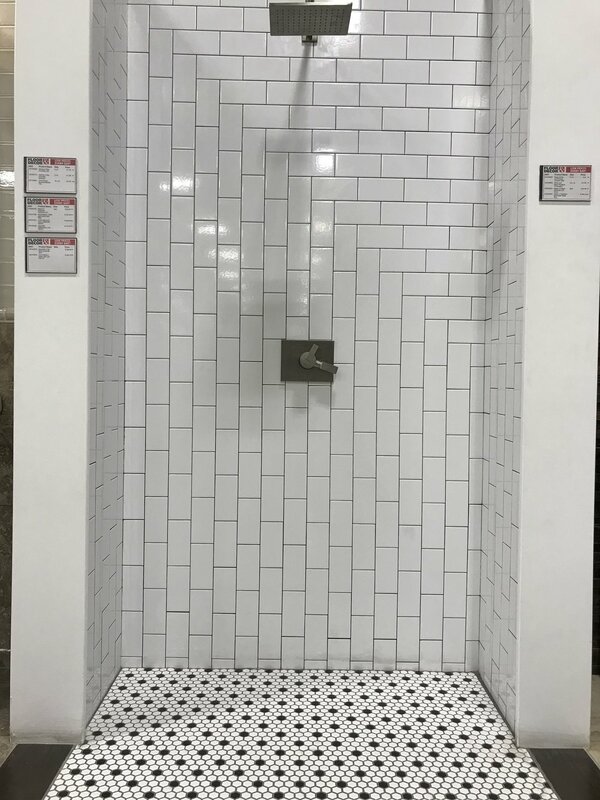 From polished marble and patterned ceramic to glass subway tile and porcelain penny tile there is literally SOMETHING for EVERYONE! I coudln’t get over the selection of available tiles, all in stock and ready for purchase and install. No need to order and wait, you can literally find what you need that day and get to work. There were so many new tiles that I had yet to see before (and believe you me, I’m up on my tile game!) that I couldn’t help but take visual inventory for future projects. I’ve always loved the organic quality of this textured porcelain tile and may or may not have had my eye on this for the master bathroom from the get-go….. I had never really noticed their stone countertop inventory before, but was pleasantly surprised to see so many quartz, marble, and granite options available — ranging from pre-fabricated slabs available for purchase on the spot, to customizable slabs through their in-home measuring service and installation. I also had no idea that these wood countertops were part of Floor & Decor’s inventory and loved the possibilities of these wood slabs. Beyond a kitchen countertop, how amazing would these wood slabs look in a laundry room or mudroom? 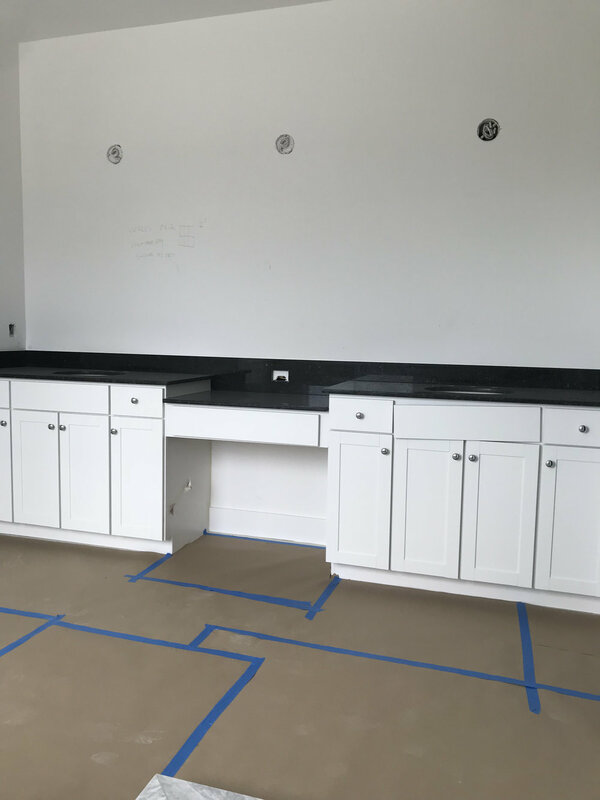 We hit up the wood flooring department, which had a plethora of options from water resistant luxury vinyl flooring to porcelain tile that looks like wood to actual hardwood…the possibilities seemed endless! I've always loved this Driftwood Oak Plank by NuCore, and was thrilled to find out it could work in a bathroom since its 100% water proof. Stay tuned for this new addition to my plans. I’m thrilled with the products I found for the master bathroom refresh and can’t wait to update you on the BEFORE and AFTER in the coming weeks! A big, huge, loving thank you to Floor & Decor for arranging this private tour and partnering with me on our master bathroom refresh. And a special shout out to Michael in the Riviera Beach, Florida store! If you’re local to the area, or ever visiting and feel the urge to renovate where you’re staying, please hit up Floor & Decor for the very best prices and inventory on all of your home improvement needs! 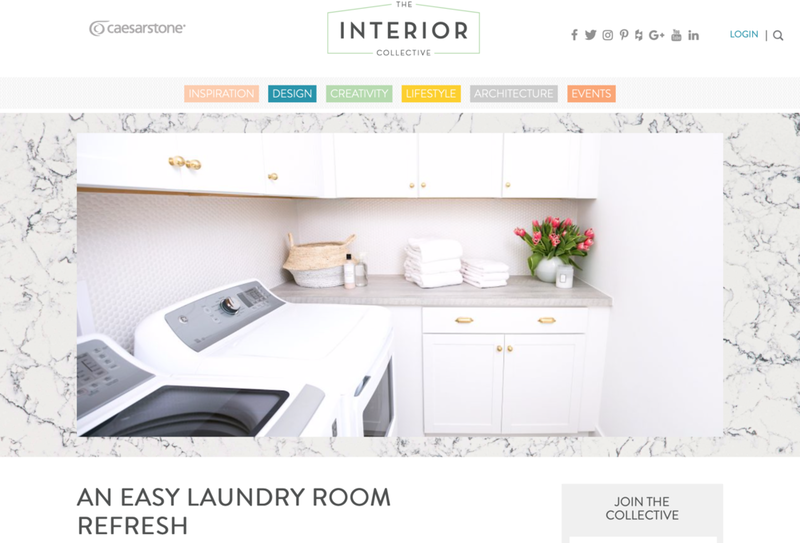 Head on over to Caesarstone’s blog, The Interior Collective, where I’m sharing an update on our laundry room and how I upgraded our basic build-grade space without a large budget or major renovation. Our Guest Room Gets a Mattress! October is my most favorite month of the year! Between the two Caplan birthday boys (The Hubs and Little Leo) AND Halloween there are so many festivities to celebrate! And celebrations typically equal guests. Amiright?! This year, my in-laws flew down from New York for the birthday weekend. In preparation, I decided to tackle the guest room. Make it more “visitor friendly” and all-around comfortable. Now you may be thinking, "why Shira, you posted a pretty picture of this room on Instagram months ago and it looked great." First off, thank you. Secondly, it was an innocent ruse! Underneath those white blankets was a measly ole' inflatable mattress! Clever for the short-term and looked fine in the picture, but embarrassing and uncomfortable for the long-term. Fortunately, the generous people of Leesa sent over one of their amazing new mattresses to complete the room. Beautifully designed and engineered with three premium foams for cooling, body contouring and pressure-relieving core support, my in-laws had the best night sleep while they were here! Are you all familiar with Leesa mattresses? If not, you should be! They are an innovative, direct-to-consumer, America-made, online brand that makes mattress shopping super easy, affordable, and efficient! They are available in the US, UK, Canada and Germany, and offer 100 nights (risk-free) with free shipping. Plus, and one would argue the best part about Leesa, they donate one mattress to a shelter for every ten they sell through their One-Ten Program. And they've sold over 30,000 mattress to date so far! Now this is a brand I can fully get behind and support! It's quite fun to unpackage the mattress too! It arrives in a compact box and with a few easy steps you literally watch it expand before your very own eyes. Check out my Instagram for that video! 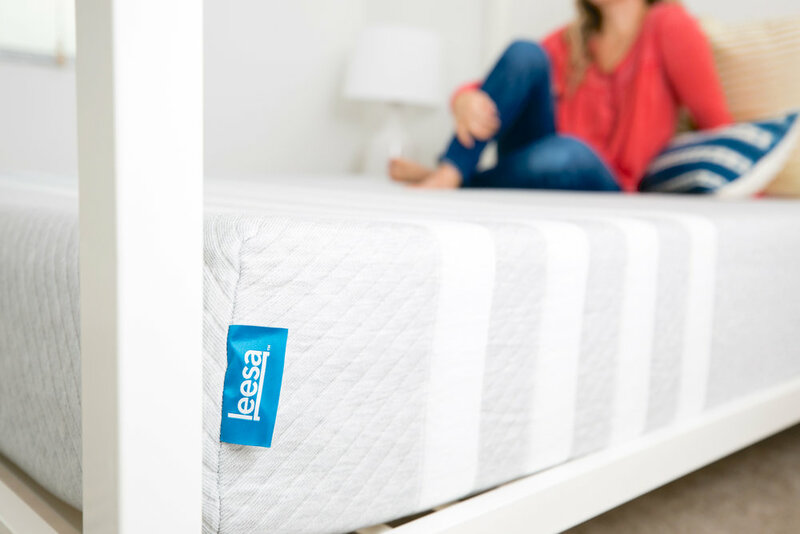 As an added bonus, Leesa is offering $150 off to all of you on your next purchase of a Leesa mattress, with code BESSINTERIORS. *A big thank you to Leesa for helping us complete our guest room!